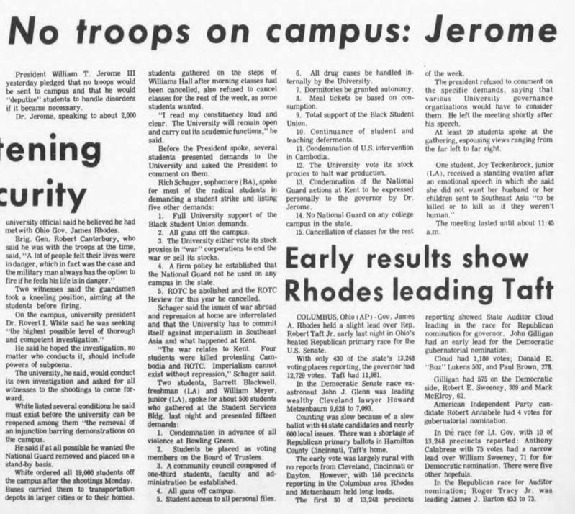 “"No troops on campus: Jerome".” Digital Gallery. BGSU University Libraries, 29 Jan. 2018, digitalgallery.bgsu.edu/collections/item/17452. Accessed 24 Apr. 2019. President William T. Jerome III yesterday pledged that no troops would be sent to campus and that he would "deputize" students to handle disorders if it became necessary. Dr. Jerome, speaking to about 2,000 students gathered on the steps of Williams Hall after morning classes had been cancelled, also refused to cancel classes for the rest of the week, as some students wanted. "I read my constituency loud and clear. The University will remain open and carry out its academic functions," he said. Before the President spoke, several students presented demands to the University and asked the President to comment on them. 1. Full University support of the Black Student Union demands. 2. All guns off the campus. 3. The University either vote its stock proxies in "war" corporations to end the war or sell its stocks. 4. A firm policy be established that the National Guard not be used on any campus in the state. 5. ROTC be abolished and the ROTC Review for this year be cancelled. Schager said the issues of war abroad and repression at home are interrelated and that the University has to commit itself against imperialism in Southeast Asia and what happened at Kent. "The war relates to Kent. Four students were killed protesting Cambodia and ROTC. Imperialism cannot exist without repression," Schager said. 1. Condemnation in advance of all violence at Bowling Green. 2. Students be placed as voting members on the Board of Trustees. 3. A community council composed of one-third students, faculty and administration be established. 4. All guns off campus. 5. Student access to all personal files. 6. All drug cases be handled internally by the university. 7. Dormitories to be granted autonomy. 8. Meal tickets be based on consumption. 9. Total support of the Black Student Union. 10. Continuance of student and teaching deferments. 11. Condemnation of U.S. intervention in Cambodia. 12. The University vote its stock proxies to halt war production. 13. Condemnation of the National Guard actions at Kent to be expressed personally to the governor by Dr. Jerome. 14. No National Guard on any college campus in the state. 15. Cancellation of classes for the rest of the week. The president refused to comment on the specific demands, saying that various University governance organizations would have to consider them. He left the meeting shortly after his speech. At least 20 students spoke at the gathering, espousing views ranging from the far left to the far right. One student, Joy eckenbrock, junior (LA), received a standing ovation after an emotional speech in which she said she did not want her husband or her children sent to Southeast Asia "to be killed or to kill as if they weren't human." The meeting lasted until about 11:45 a.m.